CoinOpCollectorForum.com • View topic - Jennings Mints of Quality, finally opened! Jennings Mints of Quality, finally opened! I bought this machine over three years ago. 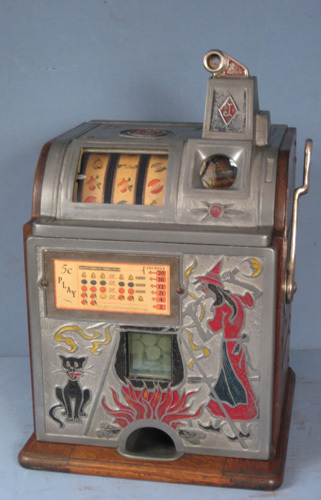 It's very similar to one my grandpa owned and that's what started my interest in slot machines, a long time ago. But it was only recently that I found an old blurry picture of what he had. Sadly the machine was "lost" by my cousin. I have no clue where it ended up. This machine has sat, working in my room. I had two locksmiths try to open the front without any luck. YEARS later now - Monti recently recommended I buy an entry level lock picking kit, which I did. It arrived a couple days ago. I sat at Starbucks yesterday and fiddled around with it. It came with a cool clear lock to practice with. I found a website with some short videos showing the action of the basic lock. A few minutes later I was using different picks to open the clear lock. Apparently I found the right one. I inserted my torsion wrench and the pick, found the binding pin which moved the wrench a little. Then I just rubbed over the rest of the pins and the thing opened. I finished my coffee, took my knowledge home and grabbed a "Master" padlock. I had that open in about three minutes. 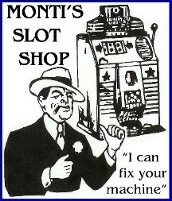 So I went to my Jennings slot machine, inserted the torsion wrench and a pick. To my surprise - CLICK! I got it opened in about 40 seconds. FINALLY I got the front panel off! First I noticed a lot of nickels. So far, all have been ones I inserted. The machine still works but the side chute is jammed and they're all just falling inside the machine. Then I noticed two very nice original labels. One large on on the back panel which I slid off after unlatching it (from the front). The other, smaller one was on the inside of the cabinet. Next I noticed a "check" that appears to have been used as a washer under a thumb screw. I'm not exactly sure how to remove the mechanism. It doesn't lift and slide out like my Mills. It was getting late anyway last night. The lock was made by Corbin. It looks old but I'm not sure if that's an original lock or not. I already had a replacement so it's on now. I don't think Corbin locks are all that expensive. If it is original I might have it rebuilt by Dave. It can't be that hard to get the mechanism out so soon as I get home and remove it, I'll post back and let everyone know if I found any old nickels under the mechanism. Re: Jennings Mints of Quality, finally opened! It likely has two screws up by the coin head -- remove those and it should slide out. It did! I actually discovered that last night before I read your reply. I kept gently pulling and realized now why that removable plate was there! Duh! Once I removed the screws, it slid right out. I found mostly nickels that had popped out of the track and on and under the mechanism. Most were the ones I had played lately but I did find two shiny "new" nickels underneath - one from 1957 and one 1954 I think. Oh, and that lock is a cheap replacement--don't bother getting it reworked. When you get a chance post some pictures, high rez like the ones you send me, of the mech, all sides, Etc. and the base plate as you had mentioned in your email that the "Deferred Pay" is not working which is probably just a missing spring or minor part if you are lucky! On the base plate there should be a flat plate that slides forward under the coin drop area which would catch the payout from the payout slides and then drop the coins on the next handle pull, hence the deferred pay! Glad that lock pick set worked for you but as mentioned above the Corbin lock is not a high security type lock so is rather easily picked! Anyway, place more pictures of the mech as mentioned here above and maybe others here can help you with the deferred pay parts missing! I'll shoot some better photos this evening. I installed a replacement Corbin front lock but am still waiting on a reply from Dave to see if the lock I removed is even worth re-keying. I don't know if it's original or not. It looks old though! High resolution pictures of mechanism and case including the topside of the lower area. Thanks for posting the high rez pictures Mark! Just had a chance to check them out as I have been very busy in the shop with customers slots and I am also working on a new acquisition of a slot machine collection! I may have missed it but did you post a picture of the lower front casting on the slot machine showing the entire front casting? And you have what looks like most of the Future Pay assembly which is good as it is usually cannibalized somewhere during its life time! However from your pictures it looks like the "Deferred Pay or Future Pay" flap that would catch the coins to negate the coins dropping into the coin payout cup that would mount on the underside of the base plate is missing! There are a couple older collectors who may have one at a reasonable price! If anyone has that delay pay assembly... PLEASE contact me!!! Looking for a proper mint vendor too. Here's a shot of the front panel. Last edited by shortrackskater on Sat Jul 21, 2018 4:40 pm, edited 1 time in total. Forgive me for using your photo but below I have described what I believe you are missing and used your photo to do so! These pieces can be fashioned out of flat stock metal but without an on hand assembly to go by can be a process of trial and error but it is do-able and using a shoulder bolt at the pivot point! And now that I have seen your lower front casting contact me in regards to the mint vendor situation you emailed me about! Okay, got to get out to the shop, work is piling up!